READING, PA This summer, 35 campers from Olivet Boys & Girls Club’s Summer Theatre Camp will be participating in FACE-THE-MUSIC, a 2-week musical immersion program sponsored by the Reading Musical Foundation and led by four professional, local, musician/educators. 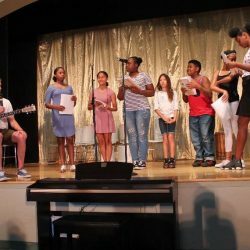 Each morning from July 2 to July 13, campers, age 9 – 15, will be studying guitar, African drumming, keyboards and vocals at their camp site, the PAL Center for the Arts at 328 Walnut Street in Reading. The workshop will culminate with a FREE public performance on Friday July 13 at 11 am at the Center for the Arts. Reading Musical Foundation (RMF) has supported Olivet Boys & Girls Club’s music program for many years through grants and scholarships. RMF currently provides 400+ hours of musical instruction during the school year at the PAL Center for the Arts and other Olivet sites in Reading. The partnership continues in the summer with Face-The-Music which serves as a perfect cross-curricular activity for the theatre campers who also taking classes in acting, singing, art and dance. The inclusion of musical instruction supports and strengthens the tools of the actor: focus, discipline, attention to detail and exploring one’s creativity within a framework. This year, the CFA theater camp will present their production of ONCE ON THIS ISLAND, Jr. (August 9, 10 and 11 at 7 pm). Performances at the PAL Center for the Arts, 328 Walnut Street in Reading, PA, are FREE to the public. For additional information about the Face-The-Music program, ONCE ON THIS ISLAND, Jr. or Summer Theatre Camp, please contact Richard Bradbury at 610-373-8910 or [email protected].